Support for the President’s party on the generic House ballot is historically lower on election day than in the spring. 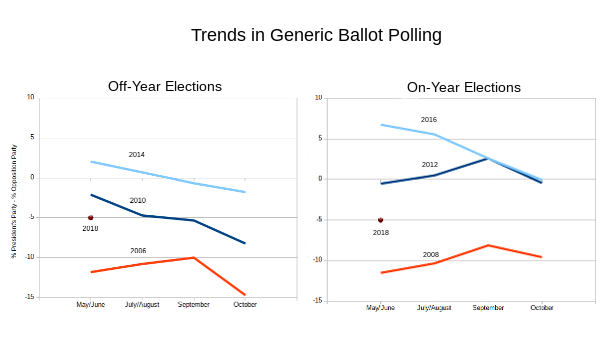 Most “generic ballot” polls attempting to forecast the 2018 general election have shown a narrowing of the gap between Democrats and Republicans in the past month or two. The gap was widest at the end of 2017 when Trump’s job-approval numbers reached their lowest point. While Republicans have regained a bit of ground since then, Democrats still have about a 5-7 point lead in recent polls. Before Republicans get too excited by this rebound, we should examine the trends for the Trump Administration in the context of previous elections. Here are two charts that depict the trends in the difference between support for the President’s party and support for the opposition in generic ballot polls. The data for 2006 and 2008 comes from RealClearPolitics; the remainder comes from the archives at HuffPost Pollster that I have used in earlier postings. In each case I have averaged polls by month, combining together May and June, and July and August, when polling is less frequent than in the fall. For both Obama years, 2010 and 2014, we see a fairly linear decline in the Democrats’ margin over the Republicans on the generic ballot. Unsurprisingly the fall in Democrats’ fortunes was much more substantial in 2010, when Obama observed that his party had been “shellacked” in the midterm. In 2006 the Republicans faced a double-digit deficit in the spring. Though they shaved a couple of points off the Democrats’ lead by September, the Mark Foley scandal ended any hopes of a Republican come-back. The Republicans begin the summer of 2018 facing a five-point deficit which might not be enough to swing the House of Representatives to the Democrats. If the history of past presidents is to be believed, though, the Republicans’ prospects may worsen as we head into November. Democrats would lead by nearly fourteen points in “generic” Congressional ballot polls next November if the trends seen since Trump took office continue. I have written earlier about how methodological differences among pollsters can lead to significantly different results. In my analyses of Presidential approval I showed how Donald Trump’s approval ratings varied depending on the choice of sample to interview and the interviewing method chosen. In this piece I apply the same approach to the so-called “generic” ballot question, typically “If the elections for Congress were being held today, which party’s candidate would you vote for in your Congressional district?” Some pollsters mention the Democrats and Republicans in this question, others leave it more open-ended like the example I just gave. 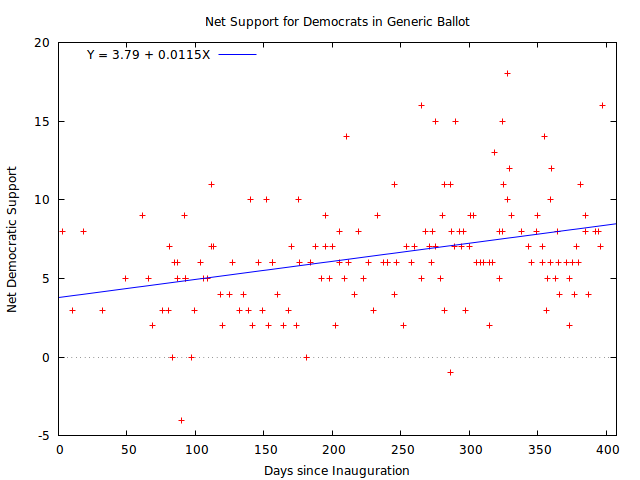 I have focused on the net difference in support for generic Democratic and Republican candidates. This ranges from a value of -4 (Republican support being four points greater than Democratic support) to a high of +18 in the Democrats’ direction. Here is a simple time plot showing how support for the Democrats on this question has grown while Trump has held office. The Democrats held a small lead of just under four points on the day Trump took office. Since then the Democrats’ lead has slowly increased to an average of eight points. What’s surprising about these data is that they do not show the usual methodological differences we see in the presidential series. Here are a few regression experiments using my standard array of predictors. 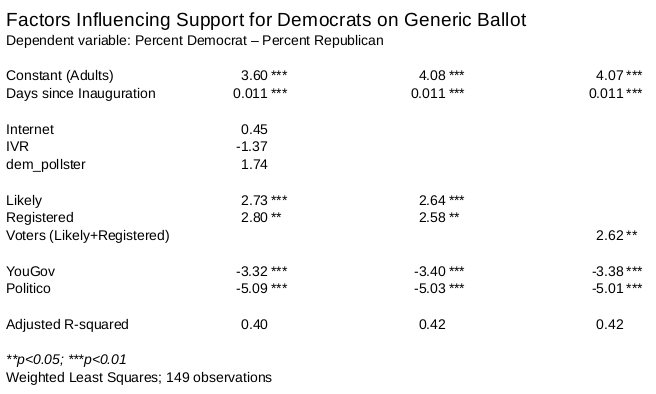 Choice of polling method has no systematic relationship with Democratic support on the generic ballot question. In contrast, Trump’s job-approval ratings run one to two points higher in polls taken over the Internet. Another striking difference is the greater level of support found for Democrats in polls of registered or “likely” voters. Again, the job-approval polls show an opposite effect, with polls of voters displaying greater levels of support for Trump than polls that include all adults. I have also included separate effect measures for the two most-common pollsters in this sample, Politico/Morning Consult and YouGov/Economist. 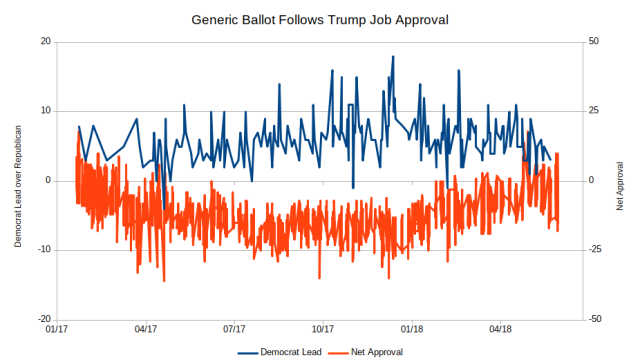 Job-approval polls taken by the former organization show a pro-Trump “bias” of about three percent; on the generic ballot their polls place Republican support about five points higher than other polls. YouGov/Economist polls also have Republican tilt on this question, though they show a slight anti-Trump bias in job-approval polls. If we extrapolate these results to the fall election on November 6th (655 days after the Inauguration), and include the effect for registered voters, the model predicts the Democrats’ lead in generic ballot polls would reach nearly fourteen percent (=4.07+2.62+0.011*655). A margin that large would easily overwhelm the built-in advantage Republicans hold based on partisan self-selection and gerrymandering. Even if the Politico figure is correct, adding in that pro-Republican factor brings Democratic support down to nine points on election day. That result would still reach nine percent, or a Democratic/Republican split of about 54-45. That 54 percent figure still exceeds the 53 percent minimum I estimated earlier would result in Democratic control of the House of Representatives. Using the model for the relationship between seat and vote divisions presented earlier, a 57 percent margin in the national Congressional vote would translate into the Democrats’ winning 55 percent of the House seats for a margin of 239-196. Three more Republican House Members announced they would not seek re-election this week, bringing the total number of retiring Republican Members to 34 according to the New York Times. That figure compares to 16 Democrats, for a net Republican difference of +18. We have to look back to the Democratic landslide in 1958 to see a mid-term with double-digit net Republican retirements. 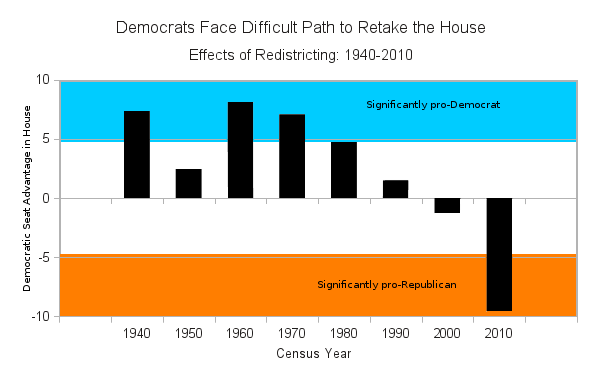 For Democrats, only in 1938 and 1978 did the number of their retirements exceed Republican retirements by ten or more. This increase of three net Republican retirements raises the predicted Democratic seat swing to 41 using the relationship depicted in the previous article. 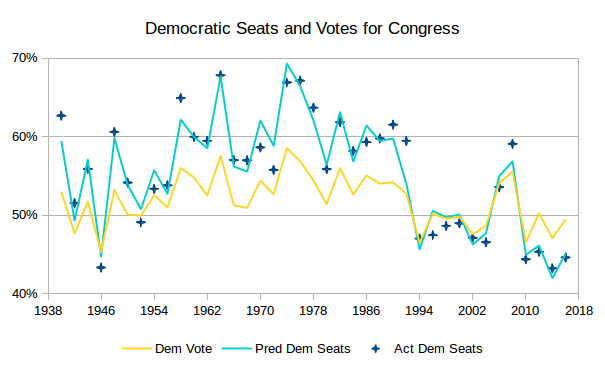 I have shown in earlier postings that the relationship between seats and votes that advantaged Democrats in the years after World War II moved steadily in the Republicans’ direction beginning in 1980 and, with the help of gerrymandering, became even more favorable for the Republicans after 2010. That might temper our belief in a prediction for an election being held in 2018. First, the 2018 retirement margin of -18 is close to the observed maximum of -21 in 1958. Perhaps the 1958 election is an “outlier” and without it the relationship is less steep than we observe. However slope and intercept coefficients estimated with 1958 excluded are numerically nearly identical to those estimated with that year included. So it’s unlikely that the historical model is radically overestimating the likely result next fall. Another test is to let the relationship differ before and after 1992 to see whether the structural changes that we observe in the seats/votes relationship in the current era appear in the relationship for retirements and seat swings. Once again, allowing the coefficients to differ before and after 1992 showed no measurable statistical difference. 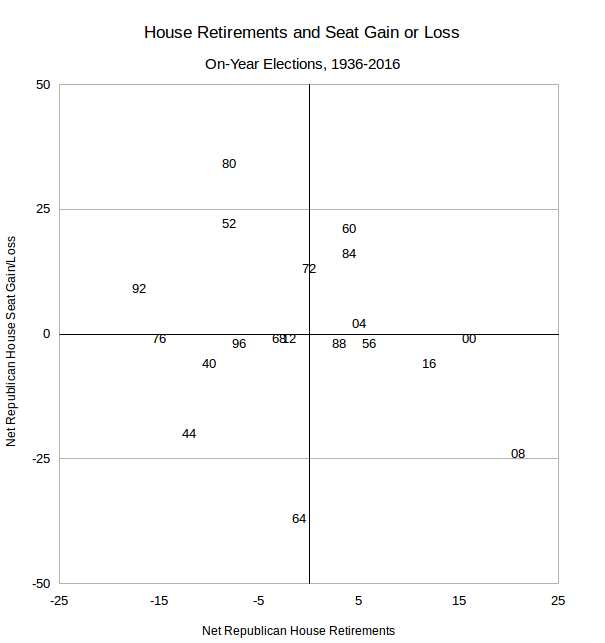 While the effects of gerrymandering and partisan self-segregation may make the House less vulnerable to “waves” of Democratic support, there is no evidence for that thesis looking at retirements as a predictor of seat outcomes. These estimates have a lot of uncertainty attached. The standard error of estimate is about 28 seats. That means there is about a two-thirds chance that the actual swing will be somewhere between 13 and 67 seats. Since the Democrats need a swing of at least 24 seats to win control of the House, even a retirement margin of 18 is not enough to ensure a change in party control. The regression model taking President’s partisanship into account is a bit more conservative; it predicts a swing of 37 seats. Update (2/26/18) – One more Republican has announced he is leaving the House, along with one more Democrat. The net difference remains at +18. 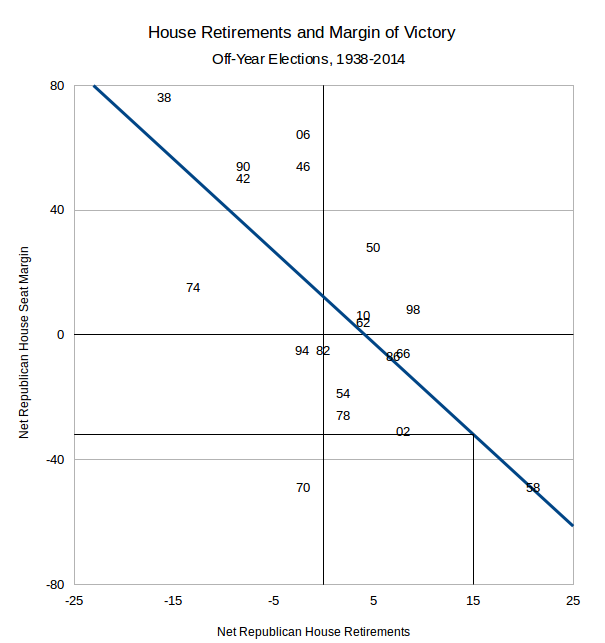 What Do House Retirements Tell Us About the Future? The pace of Republican retirements predicts that Democrats should take back control of the House of Representatives this fall by a margin of eight or nine seats. On the other side of the aisle, fourteen Democrats have announced that they will be leaving the House of Representatives. Only five of them are leaving public office, though Ruben Kihuen (D-NV) may be joining them subject to an investigation into allegations of sexual harassment. Many pundits have interpreted the much higher retirement rate for Republicans to be a bellwether for this fall’s Congressional election. If no one else announces a retirement, the Republicans will face a net loss of fifteen seats going into the midterms. Just how large a threat do such retirements pose to Republican control of the House? 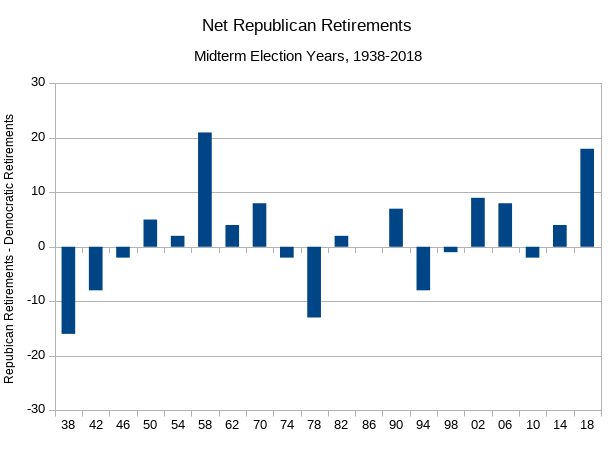 In presidential years we see little relationship between net Republican retirements and how well the party fares in the upcoming general election. What matters more are Presidential “coattails” with Republican swings in years when Eisenhower (1952), Nixon (1960, 1972), and Reagan (1980) ran. Democrats were favored when they ran along side Johnson in 1964, Obama in 2008, and Franklin Roosevelt in 1944. A much different picture appears if we look at the same relationship for mid-term years. 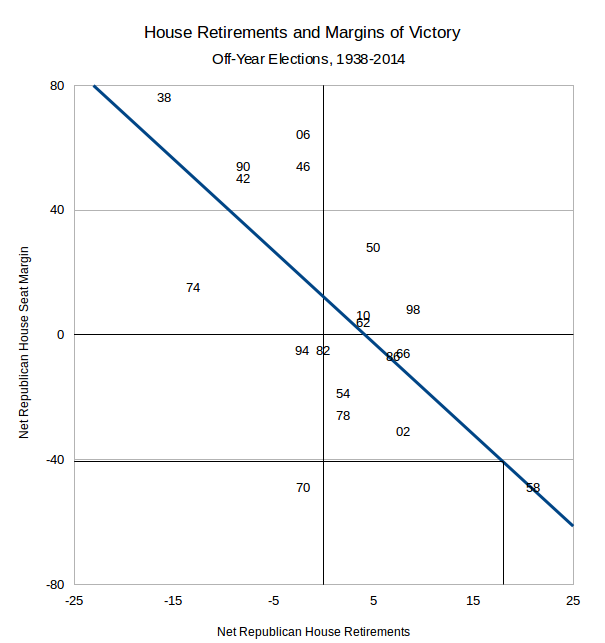 Now the number of Republican seats won or lost depends much more directly on the number of retirements. The line is anchored by the Republicans’ success in the 1938 midterm and their dramatic losses in the 1958 election. If the figure for net retirements remains at fifteen, the Republicans are predicted to lose about thirty-two seats next November. That would give the Democrats control of the House with a margin of eight seats. However, because the President’s party historically loses seats in midterms, we should expect to see more retirements from the President’s party in midterm years. When Democrats presided over a midterm, an average of four more Democrats retired from office than did Republicans. When the Republicans held the White House in a midterm year, retirements from their ranks outnumbered Democratic retirements by an average of six. So some of the strong relationship we see between retirements and midterm losses arises simply because the President’s co-partisans are jumping ship knowing that their party will do more poorly in the upcoming midterm. That leaves us with the question of whether retirements have any additional predictive power once we take the President’s partisanship into account. Retirements still matter in this better specification, though that effect just achieves statistical significance. Based on these estimates, in a year where the Democrats hold the White House, and the number of retirements on both sides of the aisle is equal, the model predicts that the Republicans should gain about thirty seats. When the Republicans hold the White House, and retirements are equal, the Democrats should gain about twelve seats (= 30.2 – 42.1 = -11.9). 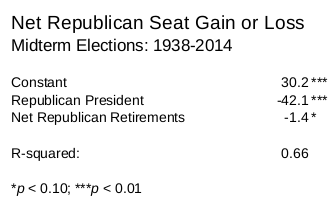 Regardless of which party controls the Presidency,* Republicans are predicted to lose 1.4 seats for every retirement. Applied to the current circumstances, this formula predicts a Democratic victory by thirty-three seats, or one more than predicted by the simpler model. *Allowing the relationship between retirements and seat outcomes to vary separately depending on which party controlled the White House added no explanatory power. In the previous article I showed that Democrats must win at least 53 percent of the national two-party vote for Congress in order to retake control of the House of Representatives. That higher hurdle to success reflects the combined effects of more extensive partisan gerrymandering by Republican state governments and the tendency of Democrats to live in densely-populated urban districts. These factors make Democratic votes for the House less “efficient” than Republican votes when it comes to determining which party controls the chamber. So what combination of political and economic factors might result in a Democratic vote of 53 percent? Political scientists have presented a number of models for mid-term elections over the years. In an early paper, Edward Tufte showed that presidential approval and short-term changes in personal economic conditions both influenced support for the incumbent using the small sample of mid-term elections he had available at the time. I find little support for an economic effect, but presidential job approval does play an important role. As always, the dependent variable is measured as a logit. Values above zero are associated with probabilities above 0.5; negative values represent probabilities below 0.5. 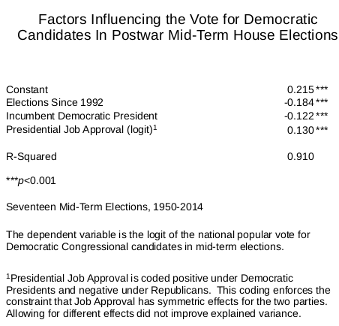 So the positive constant term indicates that the Democrats had an advantage over the period, but the coefficient for the dummy variable representing elections after 1992 is about equal in size and opposite in value. 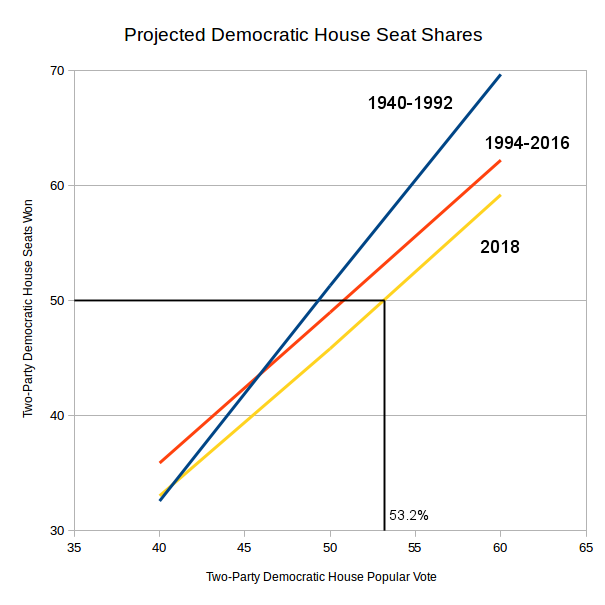 That pattern corresponds to what we saw in the last article where Democrats had a seat advantage in the House until 1994 that vanished for two decades and has now turned significantly negative. I tried a variety of measures of economic conditions, specifically changes in real per capita disposable personal income, and none of them showed any additional effect. I included a test of the “myopic” voter theory using only the change in income comparing the third and second quarters of the election year. That fared no better than an approach with a longer time horizon, the growth rate over the past twelve months. Thus there is no term in my model for economic conditions. 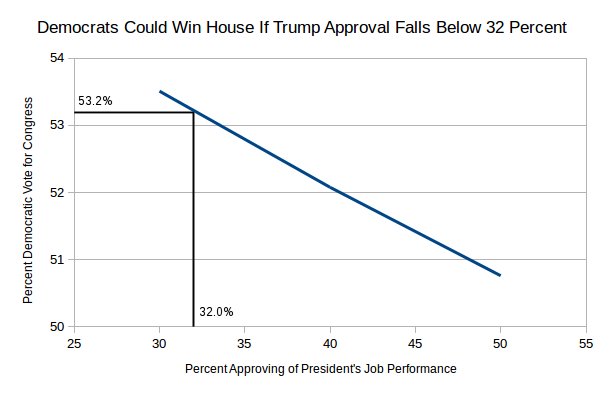 If the President’s job approval rating falls below 32 percent, the model predicts the Democrats would win the 53.2 percent of the national House vote that we saw in the last article is required to obtain a majority of the seats in the chamber. The last three Gallup polls reported Trump’s job approval at 38 or 39 percent. An approval rating below thirty is historically very unlikely. Richard Nixon in 1974 and George W. Bush in 2008 had ratings in the mid-twenties. Jimmy Carter in 1978, George H. W. Bush in 1992, and his son in 2006 received job approval scores in the mid-thirties. Of course, all of these incumbents had much higher ratings when they took office than did Donald Trump. The average decline in Presidential job approval between Inauguration Day and the first subsequent off-year election has been a bit under nine points. That would take Trump’s score down toward the mid-thirties. 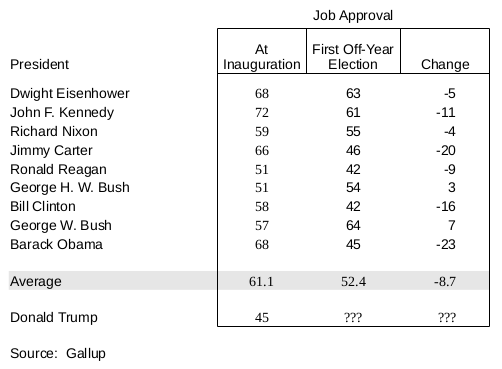 However because he started at just 45 percent approval when inaugurated, he may not experience the same decline as did presidents who started from a higher rating. For instance, it seems unlikely that Trump will experience a decline on the order of 23 points like Barack Obama did going into the 2010 midterm. In fact, the table suggests the public treats Republican and Democratic presidents quite differently. The Democrats all posted double-digit declines in job approval by the first mid-term election; none of the Republicans lost more than nine points over the same period, and approval for both Bush presidencies actually increased. Can the Democrats Retake the House in 2018? Now that all the gnashing of teeth has ended after the Republicans managed to hold on to the Georgia Sixth, perhaps we can step back and take a more systematic look at the Democrats’ prospects in 2018. Democrats will likely not make any gains in the Senate since the Republicans have only eight seats at-risk compared to twenty-three Democrats and both independents, Maine’s Angus King and Vermont’s Bernie Sanders. That leaves the House as the only target. There are two steps involved in answering this question. The first is to use our historical experience with House elections to examine how votes are translated into seats. With that information we can estimate the proportion of the two-party House vote that the Democrats need to win to take back the House in 2018. As I wrote back in 2012, a combination of geographic clustering by party and good old partisan gerrymandering has created a “Republican bulwark” in the House since the last redistricting after the 2010 Census. That means that the Democrats will need to win more than a majority of the popular vote for Congress if they intend to win a majority of House seats. I have refined this simple seats and votes model in two ways. First, I let the “swing ratio” vary between two historical periods, 1940-1992 and 1994-2016. Empirically the effects of voting “swings” on seat “swings” is significantly smaller in the more recent period. As Tufte argues in his classic paper on the seats/votes relationship, a decline in the swing ratio indicates an increase in the proportion of “safe” seats. As fewer and fewer seats have vote shares around fifty percent, there are consequently fewer that can be “flipped” by an equivalent shift in voters’ preferences. I also use the results for the 2014 and 2016 elections to more sharply estimate the effect since 2010. If we calculate the popular vote share required for the Democrats to win half the seats in the House, they would need to secure a bit over 53 percent of the (two-party) votes cast. That brings us to the second question, what are the chances that the Democrats could win 53 percent of the Congressional vote in 2018? Answering that question deserves an article unto itself. I am extending the simple model I presented in 2012 relating the proportion of House seats won by Democrats against that party’s share of the (two-party) national popular vote for Congressional candidates. It uses dummy variables to represent each redistricting period (e.g., the 2000 Census was used to redistrict elections from 2002-2010), and a slope change that starts with the Republican House victory of 1994. The results for the 2010 redistricting were based solely on the 2012 election. As we’ll see in a moment, adding in 2014 and 2016 only made that result more robust. 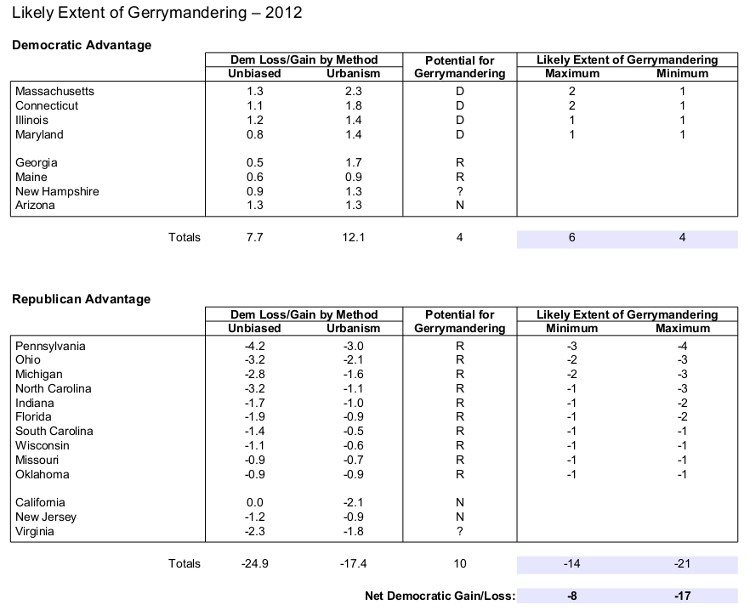 As I argued earlier, not all of this trend results from partisan gerrymandering. Americans have sorted themselves geographically over the past half-century with Democrats representing seats from urban areas and Republicans holding seats from suburban and rural areas. As partisans self-segregate, the number of “safe” seats rises, and electoral competitiveness declines. Partisan self-segregation also makes gerrymandering easier. Opponents can be “packed” into districts where they make up a super-majority. House Minority Leader Nancy Pelosi routinely wins 80 percent or more of the voters in her tiny, but densely populated San Francisco district. Many of these seats are held by minority Members of Congress because of our national policy of encouraging “majority-minority” districts. These efforts were well-motivated as a response to racist gerrymandering that would “crack” minority areas and distribute pieces of them in a number of majority-white districts. Unfortunately for the Democrats these policies have meant that too many of the party’s voters live in heavily-Democratic districts. 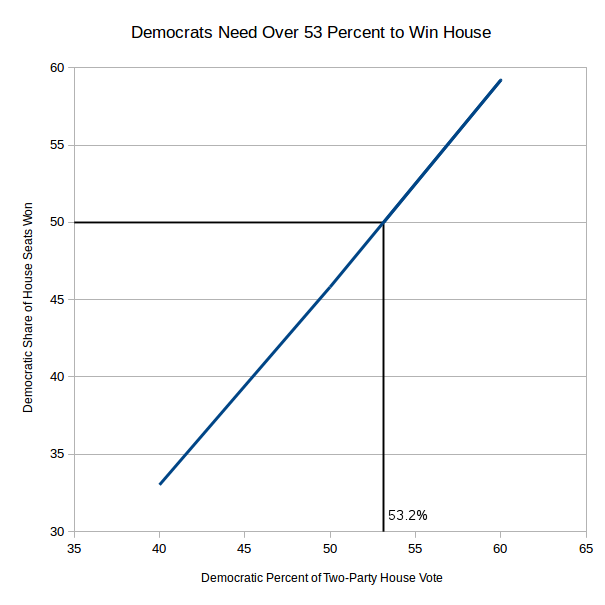 The Democrats routinely won around sixty percent of House seats between 1940 and 1992. Since then they have only held a majority in the House twice, in 2006 and 2008. Notice, too, that both the actual and predicted values for 1994 to the present show much less variance than the earlier decades. The results above show that the “swing ratio” relating seats and votes has become much smaller falling from 1.92 before 1994 to 1.33 (=-0.59+1.92) since. A smaller swing ratio indicates that House elections have become less competitive since Bill Clinton was elected President in 1992. Changes in vote shares are still amplified in seat outcomes, as they are in all first-past-the-post electoral systems like ours, but the effect has been diminished because of the increase in the number of safe seats on both sides of the aisle. The slope in the latter period is substantially flatter than in the earlier period, meaning that Congressional elections have become somewhat less competitive since 1992. Changes in vote shares have a smaller effect on changes in seat shares than they did before 1994. Finally, the third line represents an estimate for the relationship in 2018, using the 1994-2016 slope and only the post-2010 intercept shift. The chart shows that for the Democrats to win half the seats in 2018 they will need to garner a bit over 53 percent of the two-party popular vote for the House. *The intercepts in these charts represent weighted averages of the adjustments for the various Census years. For instance, the 1994-2016 line includes the coefficients for the 1990, 2000, and 2010 Census weighted by the number of elections in each decade. So in this case the 1990 and 2000 adjustments would have weights of five, and the 2010 adjustment a weight of three. The 2018 line applies only the 2010 redistricting adjustment. This table presents those Republicans who voted against H.R. 2775, the resolution to end the government shutdown and extend the debt ceiling until February 7, 2014. The “incumbent” column indicates whether the Member already held the seat during the 2012 election. Eight of the twenty are newcomers, though all but one come from districts carried by Mitt Romney in last year’s Presidential election. According to Roll Call, Michelle Bachmann has already announced her intention to retire. The remainder have made no announcements about whether they will run for re-election in 2014. Over the past few posts I have narrowed down the list of states where we might claim gerrymandering affected the outcome of the 2012 Congressional election. There is still one more task remaining — identifying those states where the partisan composition of the legislature and governorship, and the laws governing redistricting, enabled one party or the other to draw lines in a favorable manner. This table combines information on each state’s constellation of partisanship and the method by which the state allocates Congressional seats. There are four types of apportionment methods identified by Ballotpedia. Most states place control over redistricting in the hands of the state legislature with the governor having a veto in all such states except North Carolina. Nine states use nonpartisan commissions, and another five states can appoint a commission if the legislature fails to agree on a plan. I treat those states as equivalent to states where the legislature is entirely in control. Iowa reverses the backup system, with the legislature brought in only if the commission fails to come up with a plan. I consider Iowa a commission state. In the table above, I have divided the states into four groups. At the top we have the eight states with unified Democratic control of state government and laws that grant the legislature and governor control over the apportionment process. 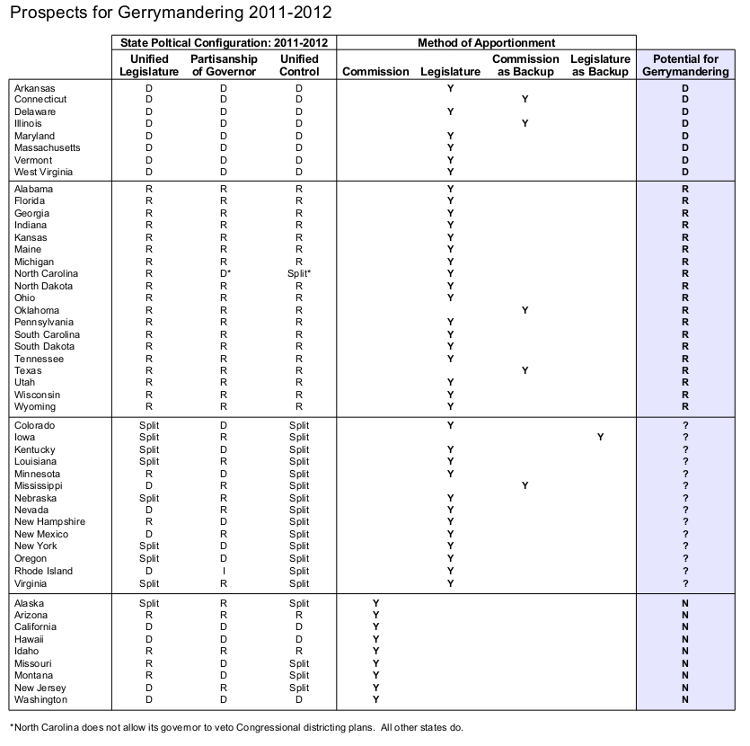 Some of the states identified in the last post as showing a pro-Democratic bias in their seat allocations like Massachusetts and Connecticut appear on this list of states with conditions favorable to Democratic gerrymandering. Then follows a much larger group of states, nineteen, which had unified Republican state houses with control over redistricting. Again we see some familiar faces from earlier tables like Pennsylvania and Ohio. The third block of fourteen states have more uncertain gerrymandering conditions because of split partisan control either within the legislature or between the legislature and the governor. The last group of nine states rely on nonpartisan commissions to draw their lines. Both California and Arizona appear on this list despite showing a Republican and a Democratic excess of seats respectively. So the last step is to combine the earlier list of states where gerrymandering might have taken place with the lists of states in the top two groups of the table above where the arrangement of political forces in the state might have encouraged gerrymandering. 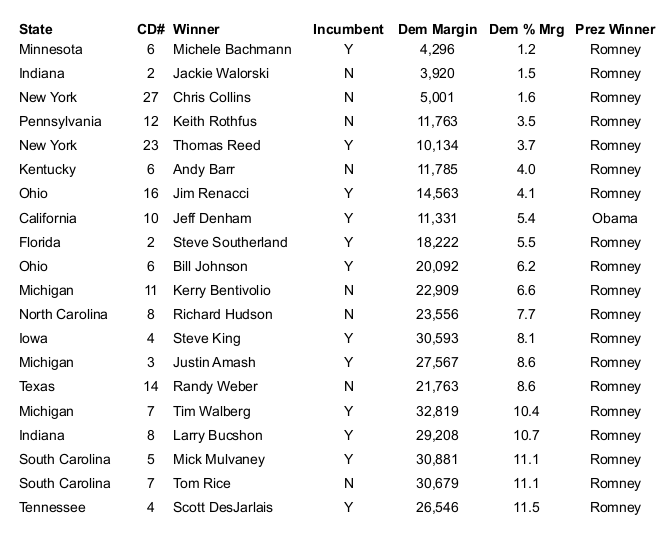 Four of the eight states with pro-Democratic seat outcomes seem likely candidates for gerrymanderers. All told, the Democrats probably won between four and six additional seats in Massachusetts, Connecticut, Illinois, and Maryland than they would have under a fair allocation of seats. Gerrymandering seems much less likely to explain the additional Democratic victories in Georgia and Maine, where the Republicans were in control of the apportionment process, or in Arizona where district lines are drawn by a commission. In Georgia, the entire process was controlled by the Republicans and was expected to produce a result favorable to that party. However one of the targeted Democratic incumbents, John Barrow, moved after his district was redrawn, contested the 12th CD, and won with 54% of the vote. Barrow’s dogged pursuit of his seat probably accounts for the “extra” Democrat in the Georgia delegation. In New Hampshire, a Republican legislature faced off against a Democratic governor, though most of political struggles took place within Republican ranks. Both seats had been captured from the Democrats in 2010, and the two new incumbents squabbled over the small changes that needed to be made to balance the two districts population. In the event both seats were retaken by the Democrats in 2012. This Democratic surge in New Hampshire probably has much to do with the regional trends to the Democrats across New England, and the efforts by the Obama campaign to mobilize Democratic voters in a swing state. Two states that showed a pro-Republican bias had lines drawn by a commission rather than the legislature, while in Virginia legislative control was split between a Democratic Senate and a Republican House. That leaves ten states with unified Republican control that show evidence of gerrymandering. At the top of the list we have Pennsylvania, Ohio, Michigan and North Carolina, all states that have been repeatedly cited by observers as being heavily gerrymandered in the Republicans’ favor. Unfortunately these observers often tend to claim the Republicans maintained control of the House entirely by gerrymandering and neglect the effects of incumbency. At one extreme gerrymandering might have given the Republicans seventeen more seats in the House. That figure combines the minimal estimate for Democratic gerrymanders, four, with the maximal estimate for the Republicans of twenty-one. If those seventeen seats had been won by Democrats, they would have eked out a one-seat majority in the House. To achieve that value, though, we have to assume that urbanism only exerted effects in the Democratic states and had no effects in the Republican ones. The opposite set of assumptions leads to an estimate of gerrymandering effects of just eight seats for the Republicans, far too few to have changed the outcome in the House. These results provide a lower- and upper-bound on the effects of gerrymandering. The actual effects probably lie somewhere in between. Perhaps about a dozen seats remained with the Republicans because of gerrymanders, hardly an insignificant number to be sure, but not sufficient to explain why the Democrats could not win control of the House despite winning a slight majority of the popular vote for Congress. Updated, November 24, 2012, with complete results for all seats except the NC 7th. If seats in Congress were allocated in an unbiased fashion, the Democrats might have won as many as twenty additional seats than they did on November 6th and would have taken control of the House of Representatives with 221 seats. Where did this large Democratic deficit come from? Democratic politicians and left-leaning pundits point their fingers at partisan gerrymandering by Republican state governments elected in the off-year landslide of 2010. Students of the redistricting process itself point to a more fundamental problem for the Democrats, the geographic distribution of their supporters. We show that in many urbanized states, Democrats are highly clustered in dense central city areas, while Republicans are scattered more evenly through the suburban, exurban, and rural periphery. Precincts in which Democrats typically form majorities tend to be more homogeneous and extreme than Republican-leaning precincts. When these Democratic precincts are combined with neighboring precincts to form legislative districts, the nearest neighbors of extremely Democratic precincts are more likely to be similarly extreme than is true for Republican precincts. 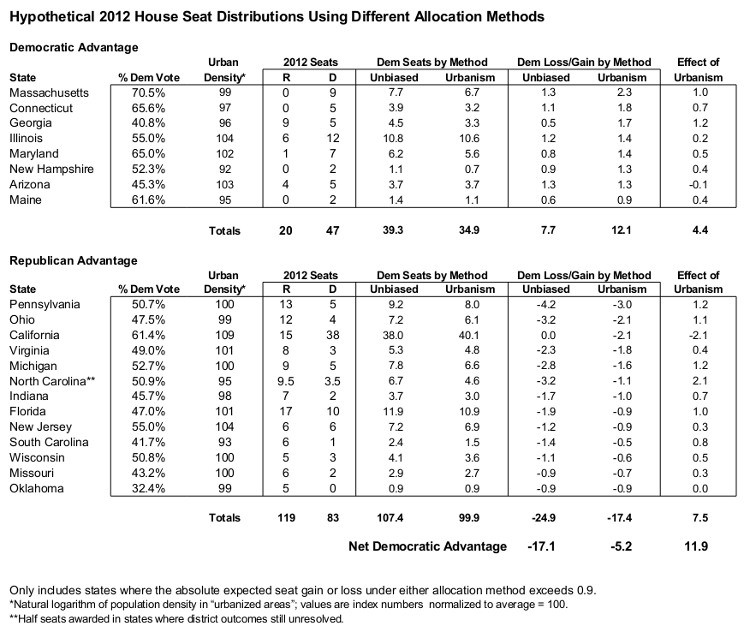 As a result, when districting plans are completed, Democrats tend to be inefficiently packed in homogeneous districts. In another study of the 2012 redistricting Nicholas Goedert observes that measures of urbanization correlate with the degree to which the Democrats gain a smaller or larger share of seats than what their votes share would predict. So before we join the critics in claiming Republican gerrymandering as the source of the Democratic seat deficit, we need to first consider the role of urbanism. The Census Bureau defines two types of urban areas — “urbanized areas” which contain a minimum of 50,000 people, and “urban clusters” which contain between 2,500 and 50,000 inhabitants. The Bureau provides detailed information by state for both these types of urban areas. I have tested a variety of these measures of urbanism by adding them to the baseline logit model for Democratic seats and votes. Typically the measures for urban clusters have no significant effect on either vote or seat shares, but the data for urbanized areas, places with at least 50,000 people, matter considerably. To get a sense of how urbanized areas and urban clusters are distributed across the country I recommend looking at two maps on this page at the Census Bureau website. The map on the left displays the density of the urbanized areas and urban clusters. We can easily identify the large urban conglomerates like the Northeast Corridor, Atlanta, Chicago, Houston, Los Angeles, and Seattle. The second map codes entire counties and shows how California’s geography differs from most of the rest of the nation. Whole counties stretching back to the Nevada border are counted as urbanized even though most of the population living in the urbanized areas are along the coast. California also dominates the list of urbanized areas when they are sorted by population density. Of the top-thirty urbanized areas ranked by population density only six are outside California. It is certainly the case that Democrats do better in states with a larger percentage of their populations living in urbanized areas. About fourteen percent of the variation in Democratic Congressional vote across states can be accounted for by the proportion living in urbanized areas. When it comes to the relationship betweens seats and votes, however, simply measuring how urbanized a state is does not affect the share of seats a party receives. What turns out to matter much more is the population density of urbanized areas. Adding that variable to our simple seats and votes model significantly improves our ability to predict the share of Democratic seats in a state given their share of its votes. It also makes theoretical sense that urban density should play an important role given the relationship between clustering and apportionment bias Chen and Rodden explore. 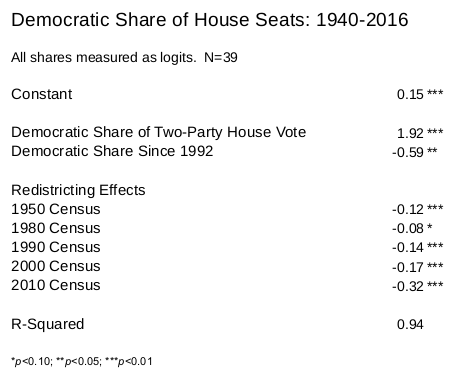 To see how urban density influences affects the distribution of Congressional seats, look at this table which shows the expected Democratic share of the seats given different values of the predictors. Look first at the 50% column. Even if the Democrats win half the vote in a state, they can only be assured of winning half the seats in the most heavily urbanized states. Even in states like Maryland or Texas, with levels of urbanism higher than three-quarters of the states, winning half the vote does not guarantee a commensurate share of seats. The effects of urban population density give the Democrats a boost in the most urbanized states, but they are few in number. There are many more states where the Democrats need to poll well above 50% to claim half the seats in those states. Given this powerful effect of urban density, I have rerun my seat estimates adjusting for the effect of urban density. Not surprisingly, the Democratic deficit compared to the unbiased allocation shrinks when political geography is taken into account, but the amount of shrinkage is striking. Let us start with the totals at the bottom of the table. Using the method of “unbiased allocations” I estimate an 17 seat deficit for the Democrats in these states based solely on the share of the vote they won. Adjusting for urban density accounts for fully 12 of those seats leaving a total deficit of just five. Two of those five seats are in California, where a nonpartisan commission draws district boundaries. As the maps above attest, the definition of “urbanism” applies rather differently to California than to the other states with densely populated urbanized areas. So we might be a bit hesitant to claim that those two seats reflect gerrymandering.